Rider Tarot - Page of Pentacles, The Hierophant, and the King of Cups. 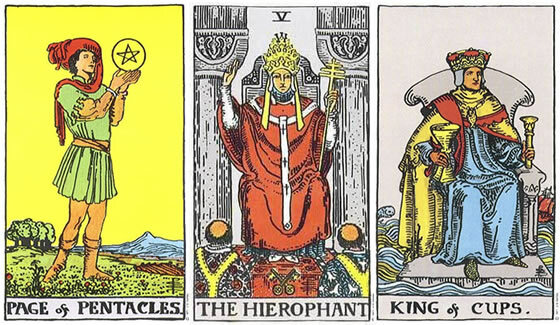 Here we have the Page of Pentacles, The Hierophant, and the King of Cups. How do the following messages apply to your life? New beginnings depend on what you focus on. If you are beginning a new venture or setting your sights on a new path, do research and find out more information to take your best course of action. New facts and information from an authority can change the way you feel about reality. An emotional attachment to an authority figure could be in focus. Asking for advice from someone with knowledge and experience can be a great influence. However, if you are naive, those in authoritative positions may decide what you should think and believe for you, so do trust your own instincts above all and think for yourself. Whether it is about money, business, or personal goals, asking someone that has authority in the field can help you feel more emotionally empowered and assured. Students embarking on a new area of focus can find valuable insights from teachers, and those in the know. If you have received advice, still know that the final decision is yours to make. Trust your instincts. Pay more attention to news about business and career prospects. A new job offer can set you on a new, prosperous path. Consultants can bring mature, helpful insights. It is your responsibility to take your enthusiasm and risk taking to go after what you want and balance it with the instructions of wise counsel. An opportunity to make money can increase. Connect with those in authority in your chosen field. Learning about money management is advised to ensure a more empowered and emotionally intelligent path forward. In any business decisions, be sure they align to moral and ethical decisions. If you are building wealth, patience and a conservative stance will assist you in more stable, longer term growth. A practical approach coupled with wise decisions can lead to emotional empowerment. Seeking guidance is recommended. A mediator may be necessary to bring an emotionally mature perspective. A compassionate, cooperative approach can bring healing. Becoming more knowledgeable about health and wellness can bring solutions. Seeking advice of a therapist can set you on a new, healthier path forward. Creative types willing to learn new approaches to their craft and artistry will step it up a notch. Self-mastery is a key goal now. Set your sights on an honest path forward. Get New Updates by joining my mailing list. Thank you so much for sharing this page with your friends online to help this site reach more people.